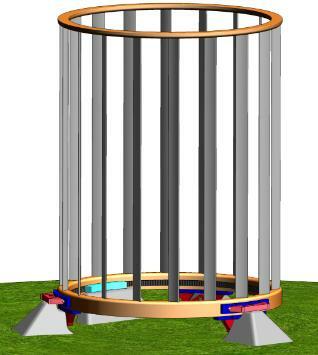 Pictured in the graphic is a Vertical Axis Wind Turbine using a conventional squirrel cage design for the aerodynamic portion of the rotor. At the base is a steel ring with an integrated generator. The whole system is suspended on three concrete piers with air bearing pads providing a frictionless, non contact suspension system that allows the generator to operate in extremely low wind speed and extremely high wind speed. All of the major forms of parasitic losses are eliminated. No steering, no gearbox and bearing friction, no pitch controls. And best of all, the weight reduction is so significant, it can easily be located offshore or on top of high rise buildings where winds blow constantly. This concept will reduce the cost of the equipment and installation significantly, as well as reduce operations and maintenance costs making it a sure bet to make wind power viable in the coming decade. Utility patents have been filed and we are ready to commence prototype testing to verify performance.